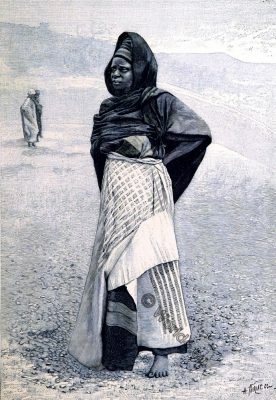 Home » Nigeria, Nupe woman around 1878. Nupe (also called Nufe or Nyfe) was once a tributary empire to the Sultan of Gwandu, in central Niger, between the 8th and 10th northern latitude with about 21,310 km². The official language was the Nupe, a nupoid language. It was inhabited by the ethnicity of the Nupe, who supposedly had immigrated from Egypt around the 15th century. The Nupe, whose number is estimated at about half a million, are mostly Muslims. The former settlement area is now the territory of the West African state of Nigeria. It is roughly the same as Nigeria’s state of Nigeria with an extension to the north. The former capital Bida is located in a plain between Niger and Kaduna. Other important cities are Rabba and Saraki. The Nupe were described in detail by the ethnographer Siegfried Nadel, whose book, Black Byzantium, remains an anthropological classic. Source: “Nouvelle Géographie universelle. La terre et les hommes”. The Earth and its Inhabitants. The European section of the Universal Geography by E. Reclus. Edited by E. G. Ravenstein. Author: Élisée Reclus. Contributor: Ernst Georg Ravenstein. Published: London 1878.